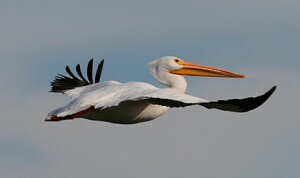 If you have been at the River “S” part of the Ridgefield NWR within the last 3 ½ months, one bird that would have caught your attention right off would have been the American White Pelican. These rare birds first started making their appearance in the first part of May with only two or three showing up on Rest Lake, Big South Lake, or Canvasback Lake. Each week the number of Pelicans would increase until a few weeks ago there was a flock of over 80 Pelicans either circling overhead or resting in one large group or smaller groups on the several lakes in the Southern part of the refuge. In the past, most years would bring one to three visiting White Pelicans that would stay for a day or two and then move on. Never, in my memory and in the memory of others, have we ever had such a large flock of Pelicans here at the refuge. Not only have we never had such a large flock, but we also have never had a flock of any size that stayed for more than one week, let alone three plus months. Some have suggested that because of the great amount of rain that different parts of the country had, especially the areas where they usually summer, they were forced to come to this area to spend their Spring/Summer. I choose to believe that when they came to Ridgefield NWR, they just liked what they saw, and decided just to stay for awhile. According to the Ridgefield NWR Wildlife Checklist, the American White Pelican is a rare bird that is not seen much at the refuge in the spring and never seen during the summer. It does appear that our checklist is going to have to be revised after this last visit! The American White Pelican is a huge white bird with a nine foot wing span. When flying, the Pelican displays black tips on its large white wings. It has an enormous orange bill that can hold up to three gallons of water at a time. They eat small fish, salamanders, and crayfish. One of the primary differences between the White and Brown Pelican, which we often see on the coast, is that the white pelican does not dive for its food as the Brown Pelican does. The White Pelican scoops up prey by dipping its bill in the water. In Washington, the American White Pelican is listed as an endangered species, so this summer we have been quite fortunate in having these magnificent white visitors stay with us for awhile. Some of the other unusual birds that have been sighted over the last month have been Blue-winged Teal, Redhead, Black-crowned Night Heron, out-of-season Sandhill Crane, Peregrine Falcon, Lesser Yellowlegs, Caspian Tern, Rufous and Anna’s Hummingbirds, Black-bellied Plover, Band-tailed Pigeon, Eurasian Collared Dove, Pileated Woodpecker, Olive-sided Flycatcher, Pacific-slope flycatcher, and Yellow-breasted Chat. Please come and visit the refuge if you haven’t lately. You might be surprised by what you see.